My new Long Exposure Portraits tutorial shows how to use a lot of light painting tools and long exposure techniques in conjunction with your studio flash portraits. Click on the image above to find out more. 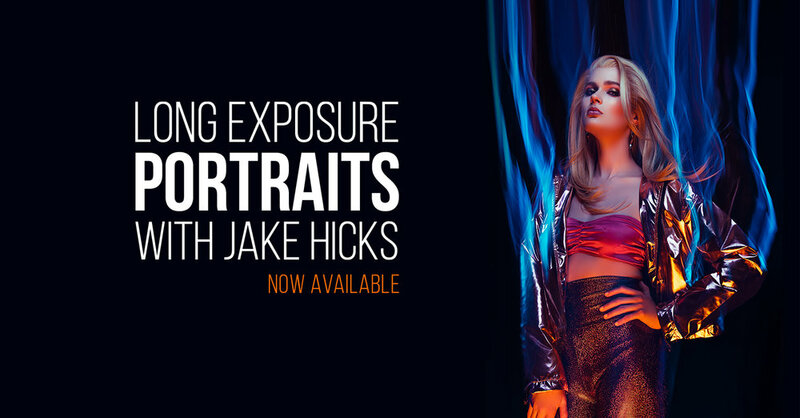 Since the recent release of my new Long Exposure Portraits tutorial from RGG EDU, I've been inundated with messages and questions relating to the light painting section. 'What's the best light paining tool to use? 'Which ones did you use in your video? With this in mind, I sought to put together this guide to answer all of these questions and more. I'll not only be explaining the ones I personally used in the video and where to get them, but I'll also show you other light painting tools that are fun to try and that you likely already own. One of the best things about long exposure photography for me, is the ability to turn seemingly uninteresting objects and locations into exciting and visually engaging imagery. I'll be showing you some examples of simple household objects you can use to get awesome shots and I think this perfectly illustrates how practically anything that emits light, can create interesting long exposure effects. First up we'll look at a tool you all should have somewhere at home and that's a torch (flashlight). In the example images below I'm actually using Maglite torches. Maglite's have a fairly unique ability in that their tops can be removed to expose the bulb and you can do this when they are turned on. This means we can have a very small, but bright bulb isolated in the shots to create light trails incredibly easily. All you have to do is turn them on, remove the top, and then move them around whilst the shutter is open and you're done. Maglite’s were very popular before LED's came along, but if you still have some in a drawer somewhere then they create great long exposure results very easily. The light trails produced by simple torches/flashlights are very easy to produce. Here I'm simply holding two torches together to get this dual streak effect. Next up we have the LED flashlight alternative in the form of this handheld work-light. These particular lights generally have a long line of LED's attached to a handle and this is perfect for waving around during the long exposure time period without fear of getting your own hand in the shot. For my one, I simply added a diffusion gel to eliminate the harsh individual LED bulbs and then I also cut a series of gels to wrap around it too. I not only cut individual colours from old gel sheets but I also cut several smaller, different coloured gels and taped them together to get multi coloured streaks in the final images you see below. These gels were then held in place with an elastic band to avoid them slipping or falling off. Click to enlarge. In the above shot (top left) you can see my original LED handheld lamp. It has a single sheet of diffusion gel wrapped around it to soften the individual bright bulbs. Next to that (top right) I have a single pink gel attached to it as well. Lastly I cut up some old gels into strips and then taped them together with black tape before attaching the whole thing to the lamp (bottom right). In the top left we have the result of just the white light. In the top right we have a single coloured gel attached, and in the bottom two shots we have the different coloured gel strips attached instead. Click to enlarge. In these portraits we can see the simple LED work-lights creating some very cool effects when they have different coloured gel strips attached to them. Here's one that you'll almost certainly already have; a smart phone. These are actually excellent light painting tools for a number of reasons; firstly, you can put any colour you want on your screen, even graduated colours. Another bonus to using them is that you can adjust the brightness of the screens, and some go very bright indeed which is perfect for combining them with flash and other brighter light sources. Lastly the other benefit of using your phone is the clean colour it produces. Sometimes when mixing flash and ambient lights you get odd mismatching colours, the phone screen is a very consistent colour that is very similar to that of flash. Normally I'd provide a link here, but I think it's highly unlikely that you need my help to find a smart phone. 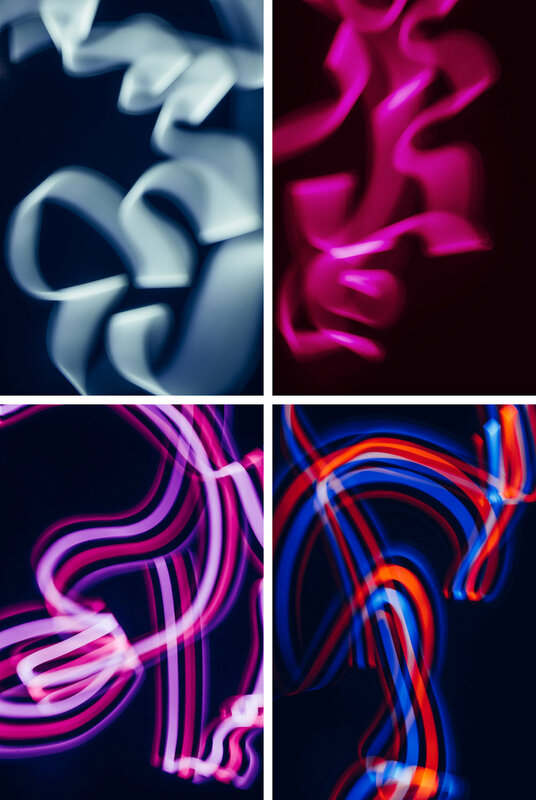 Smart phones make great light painting tools because they are bright, can display any colour or gradient you like and they produce a colour that is very similar to flash. In the above shots we have light trails produced by my smart phone. On the left I have a single pure pink colour being displayed on my screen and in the other two images I have a gradient of colour being displayed. With the ability to display any colour or image on a hand held screen the possibilities for long exposure light trails with your phone are practically limitless. As with so many of the other DIY long exposure tools, the options are huge when it comes to this next one. Fairy lights are perfect as they are very small and very bright points of light which is ideal for what we need them for. There is nothing stopping you from using the regular plug-in fairly lights but the cable can get a little cumbersome when you're trying to produce shapes and swirls during a long exposure. My advice would be to pick up a couple of LED fairy light strings that are powered by batteries. That way you can put the battery in your pocket and move around with the lights far more freely. These tiny little LED fairy lights are very cheap and also incredibly easy to use. Due to the nature of the tiny bulbs, LED fairy lights produce very strong and clean results that are easy to use and control. So as well as having fun with a variety of light painting tools that you can find at home, I wanted to share the tools I actually used in my tutorial and where to get them for yourself. Of course there is nothing wrong with playing around with any light source to create the light trails, but these purpose built tools really are excellent and in my opinion really do elevate the look and feel of the long exposure effect to another level. The tools I used were from a company called Light Painting Brushes and if you head over to their site, you'll quickly see that they have an absolute ton of clever tools to get your long exposure imagination going. But although there are so many viable options to play with, I personally decided to work with their Plexiglas brushes. These come in a variety of shapes but the ones I fell in love with were the Plexiglas Diamond and the Plexiglas Rectangle as the results they produced in conjunction with my flash photography were outstanding. Thankfully these couldn't be simpler to use, all you need is the Plexiglas brush, their connector and a torch/flashlight. You connect the brush to the connector and then you insert the torch into that and you're done. The Plexiglas brushes couldn't be simpler to use. Attach the connector to the brush and then insert the flashlight and you're done. One recommendation I will make here is to use a powerful flashlight and ideally it needs to be an LED flashlight. The reason for this is due to the nature in which this product works. 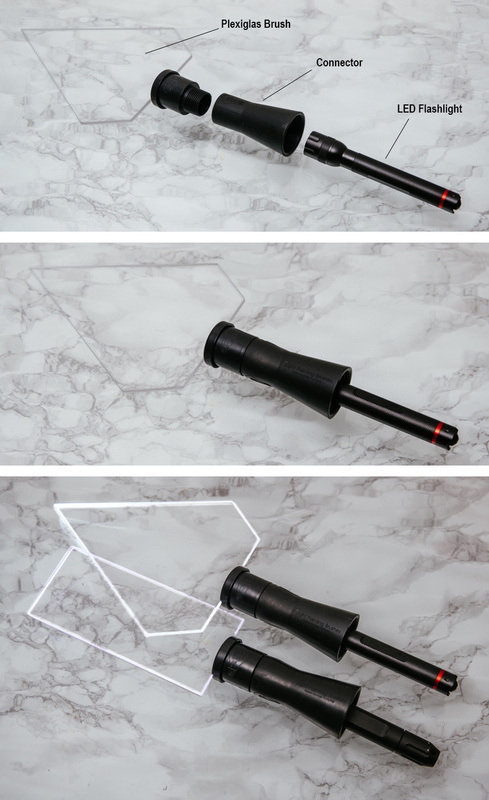 For example the Plexiglas appears to light up but in fact the torch is only catching light off the edges of the Plexiglas so a lot of the power is seemingly lost. Also, having an LED torch means that the colour produced with it will be very similar to the colour produced by your flashes making combining the two light sources in a single shot much simpler. Click to enlarge. In the images above you can see how incredibly clean and crisp the Plexiglas brushes look with a variety of movements during the long exposure. Of course don't stop your creativity there as we can very easily add and change the colour of these beautiful ribbons of light by simply applying coloured gels to them. Below are just some of the shots I captured with the coloured gels and I say 'some' because I took so many images whilst I was testing these out. The process of trial and error and then reviewing these stunning results immediately, is actually very addictive. As you begin to shoot you very quickly learn what works and what doesn't. Experimenting with moving it slower, faster, big movements, small movements... the list goes on but it never ceased to amaze me just how different every single frame was. Click to enlarge: Above we can see some stunning examples of the Plexiglas brushes being used in conjunction with coloured gels. These are all single shots, there’s no layering of frames here and the hi-res versions of these genuinely feel like art in their own right due to how crisp and clean the coloured light ribbons are. With those incredibly clean and crisp coloured ribbons of light, it only seemed sensible to add them to my coloured gel portraits with flash as well. All of the images below are captured within a single frame and they all use the Light Painting Brush’s Plexiglas tools in them to create the effects. Click to enlarge. All three of the images above are each captured in a single frame and use both flash and the Light Painting Brush’s Plexiglas tools. Like I mentioned at the start, almost anything that emits a constant light source can be used to create light trails within a long exposure shot. I've shared 5 products that I recommend playing with, 4 of which you most likely own already. Plus the beauty of the DIY versions I've mentioned is that you can start to play around with the technique immediately, then if you decide you really enjoy the looks you're producing, upgrade to the Light Painting Brushes to get those more refined and polished looks.